In this time of mourning, express all the faith, hope and love they inspired in you with a beautiful arrangement for inside the casket. 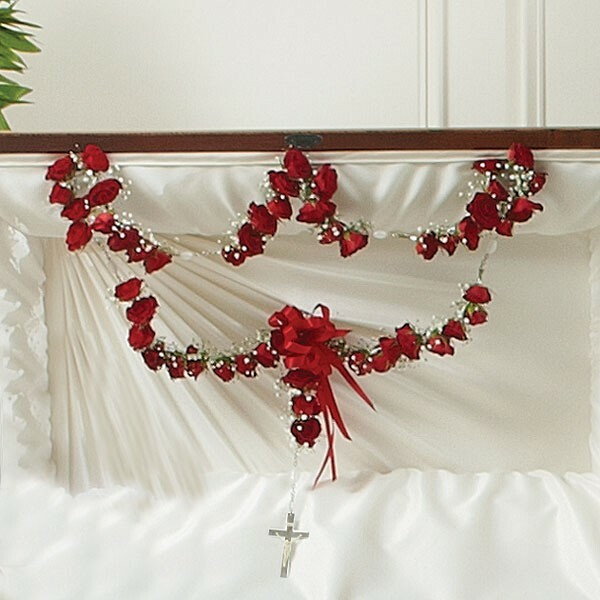 Our florists craft this touching tribute from one dozen fresh red roses and a string of rosary beads, and then finish it off with baby's breath and a satin ribbon. It's a heartfelt way for children and grandchildren of the departed to celebrate a family's shared faith. Arrangement of one dozen fresh red spray roses draped around a large string of rosary beads, accented by baby's breath and finished with a satin ribbon. Sympathy and funeral flower arrangements from Plantshed.com your local Manhattan florist.